Je me mis à concevoir l’homme comme une tentative révolutionnaire en lutte contre sa propre donnée biologique, morale, intellectuelle. The critical, emotional and intellectual change which every immigrant is obliged to endure and confront is experienced with singular intensity by immigrant writers who have also adopted another language for their literary expression. Concentrating on European authors of the second half of the twentieth century who have chosen French as a language for their literary expression, and in particular the novels by Romain Gary, Agota Kristof, Milan Kundera and Jorge Semprun, with reference to many others, this book explores some of the common elements in these works of fiction, which despite the varied personal circumstances and literary aesthetics of the authors, follow a similar path in the building of a literary identity and legitimacy in the new language. The choice of the French language is inextricably linked with the subsequent literary choices of these writers. 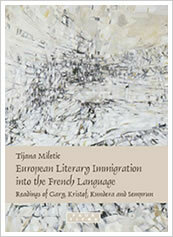 This study charts a new territory within Francophone and European literary studies in treating the European immigrants as a separate group, and in applying linguistic, sociological and psychoanalytical ideas in the analysis of the works of fiction, and thus represents a relevant contribution to the understanding of European cultural identity. This volume is relevant to French and European literature scholars, and anyone with interest in immigration, European identity or second language adoption.